Black Friday Bundle, Virtual Intrument Bundle from PropellerHead. For Black Friday, Propellerhead offers multiple discounts as well as a bundle with 6 Rack Extensions available until November 30th. This bundle is available until Sunday only for the price of 159€ at shop.propellerheads.se. 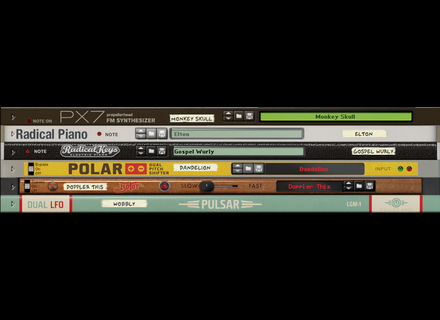 The other Propellerhead Rack Extensions are also on sale, have a look there. Toontrack Hi-Energy Grooves MIDI Toontrack adds a new MIDI drum library with grooves played by Jason Bowld for metal projects using EZdrummer and Superior Drummer. [BKFR] The Nave iOS synth on sale Waldorf celebrates Thanksgiving with a special reduced price for its Nave synthesizer app for iPad until December 1st. Audiomodern launches Abuser for Kontakt Abuser, Audiomodern’s new instrument for Kontakt, is an “virtual analog” hybrid synth.